Posted on August 19, 2012, 2:35 pm, by Kathryn Huxtable, under Other. H&H Color Lab offered me a position in December, so I’ve been an employee rather than a contractor since then. I’ve been awfully busy working on their desktop apps. But we did get a Sea Glass Look and Feel release out in our copious free time. We are now at version 0.2. 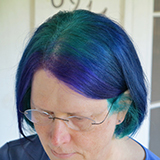 Since I can’t seem to get much control over other parts of my life, I’ve been coloring blue streaks in my hair. I’m thinking of doing a lot more of that anon. Posted on November 19, 2011, 8:51 am, by Kathryn Huxtable, under Other. Since June, I’ve been working at H&H Color Lab, which processes color photos from professional photographers and produces high-end products such as wedding albums, greeting/anniversary/graduation cards, canvas gallery wraps (made by dye sublimation of an image onto canvas and wrapped around a wood frame), and much more. They also can handle normal photo prints. I’m a contractor, which means I don’t know how long they’ll keep renewing my contract, but that’s really the case for most work these days. I’m doing desktop applications programming using Java Swing, which is a lot of fun, and I already had experience doing that kind of work. H&H makes several applications that can be downloaded and used to compose, say, an album, a greeting card, or a metal water bottle and then packages up the order and submits it over the internet for processing. So we have stuff that allows you to drag and drop photos, crop them, organize them, etc. Think of it sort of as Adobe InDesign lite with the ability to order prints. One thing I’ll say about this company is that they keep you busy. I haven’t had any time to work on outside projects since I started. Posted on May 3, 2011, 5:32 pm, by Kathryn Huxtable, under Other. But I’ve been busy with work. Posted on December 14, 2010, 9:07 am, by Kathryn Huxtable, under Science. The wind is no longer at Voyager’s back. It’s in the heliosheath. This means that in a few years Voyager will have left the solar system and be in the interstellar medium. Amazing. Imagine! It was launched before personal computers were everywhere, before cell phones, before the internet! But it was given a powerful boost by its rocket, and another by the two largest planets in the solar system as it swung by them. And now, in just a few more years, it will have left our nest forever. Posted on November 4, 2010, 4:18 pm, by Kathryn Huxtable, under Politics. He says that stuff doesn’t matter very much. Posted on November 2, 2010, 12:57 pm, by Kathryn Huxtable, under Philosophy. There are a few (I think just two) NSFW words in this. Otherwise, it’s totally amazing. Posted on October 27, 2010, 1:04 pm, by Kathryn Huxtable, under Other. Phil Plait has a new post on his Bad Astronomy blog, referencing an article on Chandra Wickramasinghe’s claims that NASA is hiding evidence of life on Mars. It’s a good comment. There’s no good evidence for NASA hiding life, and Wickramasinghe has a tendency to cry wolf. Posted on October 27, 2010, 11:47 am, by Kathryn Huxtable, under Politics. James Kwak on The Baseline Scenario has a new post, titled beyond crazy, making the case that simple attempts to measure professorial productivity are rather counterproductive. It’s in line with what I was saying earlier. Posted on October 19, 2010, 12:07 pm, by Kathryn Huxtable, under Politics. Posted on October 7, 2010, 12:25 pm, by Kathryn Huxtable, under Other. I’ve talked about this before, but not here. The Monterey Bay Aquarium has a well respected Seafood Watch program, giving advice on what seafood is harvested sustainably. This came to mind because I noticed that Orange Roughy was on the menu at a local seafood place. No one should eat Orange Roughy. There’s no way to harvest it sustainably without it costing hundreds of dollars per pound, which is not what they were charging. Contact kathryn@kathrynhuxtable.org with questions or comments about this page. All comments are owned by the original authors.